Dubai, Sept 24: Al Wasl football club manager Diego Maradona kicked a fan, who interrupted a pre-match photo session. The supporter was continuously lifting Maradona's banner to catch his glimpse. The banner, which was sent to Maradona by his daughters Delma and Giannina, read: `Babu Estoy con vos te amo -Benja,' meaning `Grandfather I love you and I am with you' and was signed by his grandson Benjamin. Argentina’s recent devastating 4-0 loss against Germany in the World Cup quarter-finals has raised a question regarding Maradona’s continuation as Argentina’s coach. An online poll by a newspaper showed 63.1% people want Maradona to quit. Similar results were shown by other polls as well. The last major title Argentina won was the Copa America in 1993. The team had won the World Cup in 1978 and 1986. This year the team came back on track for a seemingly third World Cup title after winning all the group matches against Nigeria, South Korea and Greece. 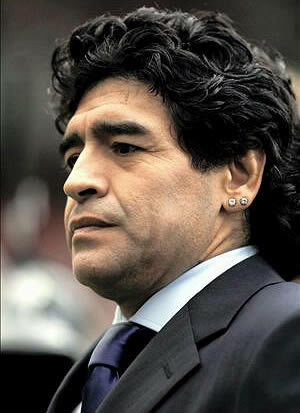 London, Dec 30 : Argentinean football legend Diego Armando Maradona is all set to become father again at the age of 49. Maradona will become dad again, a year after he became a grandad. The Argentina manager’s 29-year-old girlfriend Veronica Ojeda is said to be expecting. Maradona has four other children, the Daily Star reports. London, Oct. 28 : Argentinean Football legend Diego Maradona has predicted that winger and Chelsea's first transfer target, Angel Di Maria, will emerge as a worldwide superstar within the next two years. "Angel has the quality to be a worldwide superstar within the next two years. I have always followed his career closely and his level has increased enormously since he's been in Europe," The Mirror quoted Argentina boss Maradona, as saying. 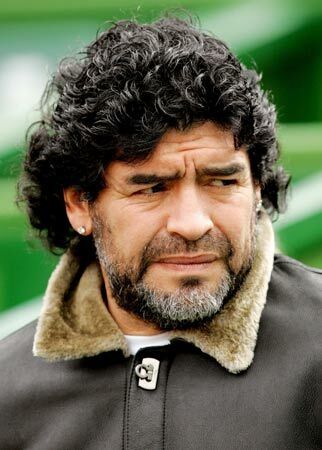 London, Oct. 7 : Football legend Diego Maradona has revealed that he may resign as the Argentina coach next week unless certain conditions are met. Argentina will play their final two World Cup qualifiers next week against Peru and Uruguay. But even if Argentina qualifies for South Africa, Maradona will meet with national football association president Julio Grondona to discuss matters. Rome, Sep 19 : Beleaguered football legend Diego Maradona had to hand over his diamond studs to police as part payment for the millions he owes the Italian tax authorities. Italian officials paid the holidaying Argentinean coach a visit at the luxury hotel he was staying in and seized the earrings worth nearly 4,000 pounds, Sky News reports. Police claimed that Maradona still owes some 20 million pounds, dating back to his seven-year stint at the Italian club Napoli, where he frequently failed to pay income tax. Buenos Aires (Argentina), Sep 7 : Argentina coach Diego Maradona, who faces the axe if his team fails to qualify for next year''s World Cup in South Africa, has said that he will not quit rather he would “work hard like crazy”. The two-time World champions was beaten by South American rivals Brazil, and are currently fourth in their group, just two points ahead of Ecuador and Colombia. Buenos Aires - Diego Maradona is an expert in extremes, and he got another dose of them as Argentina coach in recent days, with glory in Saturday's thrashing over Venezuela and disaster in Wednesday's historic and humiliating 6-1 loss to Bolivia. The current situation raised uncomfortable questions as to national football legend Maradona's ability to lead Argentina in the South American qualifiers towards the 2010 World Cup in South Africa. Rome - Argentina football icon Diego Maradona has paid a minimal part of the large tax payment he owes the Italian state from the years he spent playing with Napoli, the Association of Italian taxpayers (Contribuenti. it) reported on Saturday. 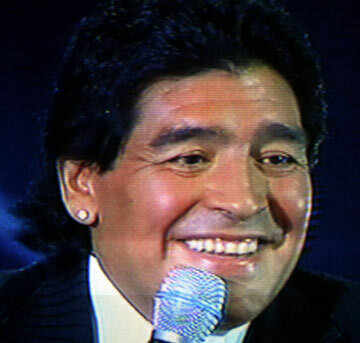 "The Italian revenue has been unable to levy from Maradona more than 0.10 per cent (of what he owes)," said Contribuenti. it president Vittorio Carlomagno as he criticized how taxes are collected in Italy. London, March 28 : Legendary footballer Diego Maradona has launched a scathing attack on Pele, saying that the latter lost his virginity to a man. His gay jibe was a reaction to the Brazilian football star's statement that Maradona was "a bad example" to youngsters for having taken drugs. "What do you want me to say? He made his debut with a bloke," the Mirror quoted Maradona as saying, when asked about Pele's jibe. Buenos Aires - Thousands of people gathered Friday to buy tickets for Argentina's game against Venezuela in Buenos Aires, which was set to be Argentine football legend Diego Maradona's first official match as national team coach. The queue was more than 700 metres long to get one of the 13,000 "popular" tickets for the Monumental stadium, the cheapest option available at around 10 dollars each, to watch the historic game on site. London, Mar. 21 : Argentina football team coach Diego Maradona has offered to help fallen England football hero Paul Gascoigne kick the booze habit. According to the Daily Star, Maradona has invited Gazza to his home to ensure that he stays sober. Maradona, 48, who has beaten cocaine addiction, reckons he is the perfect influence to keep the England legend on the wagon. Gazza, 41, revealed in a TV interview how he was contacted by Maradona, whose infamous "Hand of God" goal knocked England out of the 1986 World Cup. Buenos Aires - Talented midfielder Juan Roman Riquelme's decision to refuse to play for Argentina in the future has strengthened Diego Maradona's control over the national team and his position in the face of internal conflicts. Riquelme announced his decision late Tuesday, but it hardly upset many fans in the football-crazy South American country. A few people backed the player at the Boca Juniors training session Wednesday, but an online poll in the Argentine daily Clarin said that 62.5 per cent of those who replied were in favour of Riquelme's exit. London, Feb. 25 : Veteran football champion, Diego Maradona may be headed for jail as a judge has ordered him to appear before the court in connection with a hit and run case. Maradona may face a year in jail term for ramming his car into a telephone booth in which two persons were severely hurt two weeks ago. According to The Sun, witnesses claimed that Maradona fled from the accident site in the Buenos Aires without giving his personal details. Madrid (Spain), Feb. 20 : Diego Maradona became a grandfather on Thursday when his daughter Giannina, 21, gave birth to a son at a hospital here. According to The Sun, the boy was named Leonel after Argentine and Barcelona star Lionel Messi, who is the best pal of his dad, Atletico Madrid ace Sergio Aguero. Maradona says Messi is "the best in the world"
Buenos Aires - Argentina coach Diego Maradona on Friday named Barcelona striker Lionel Messi "the best (player) in the world," even through Portugal's Cristiano Ronaldo was crowned 2008 World Footballer. "I voted for Cristiano Ronaldo, Adebayor and Ibrahimovic, because I could not vote for Messi," said Maradona. "Logically, the best in the world, for me, is Messi." London, Jan. 12 : Argentinian football boss Diego Maradona triggered off an alarm at 7 a. m. on Sunday by puffing on a Havana (cigar), and is now being blamed for Chelsea''s defeat against Manchester United, as the team was staying in the same hotel as the Argentinians. According to The Sun, the alert led to 200 guests being evacuated from the posh hotel in Manchester where Chelsea were staying before their match with Manchester United. Chelsea lost the match three goals to nil at Old Trafford following their night of shattered kip.